The Dave Smith DSM02 Character Module in Eurorack format takes the digital effects from the Prophet 12 and Pro 2 and puts it into a 14 HP Eurorack module. It has 5 effects in all and runs at 24 bit, 96 kHz resolution. It's great for subtle tone bending and shaping or aggressive sound mangling! Girth and Air provide sophisticated low- and high-frequency harmonic enhancement, respectively, for defining and refining a sound. Decimate performs sample rate reduction for adding lo-fi grunge. Hack is a bit-crusher capable of trashing an otherwise clean signal nearly beyond recognition. Drive adds overdrive and saturation, with warmth at one end of the knob and intense harmonic overload at the other. The DSM02 can essentially be used as a final effect for a sound source. The various effects can be subtle to extremely mangled depending on the settings you give it. Trashy sounds can instantly be created by turning up the girth and decimate knobs, which creates an aggressive and totally raw output. Each effect can shape, twist and mangle your sound making the module an ideal tool for transforming and beefing up your sound source. The Character section of the Pro 2 and Prophet 12 is a fundamental part of what gives those instruments their unique sound. 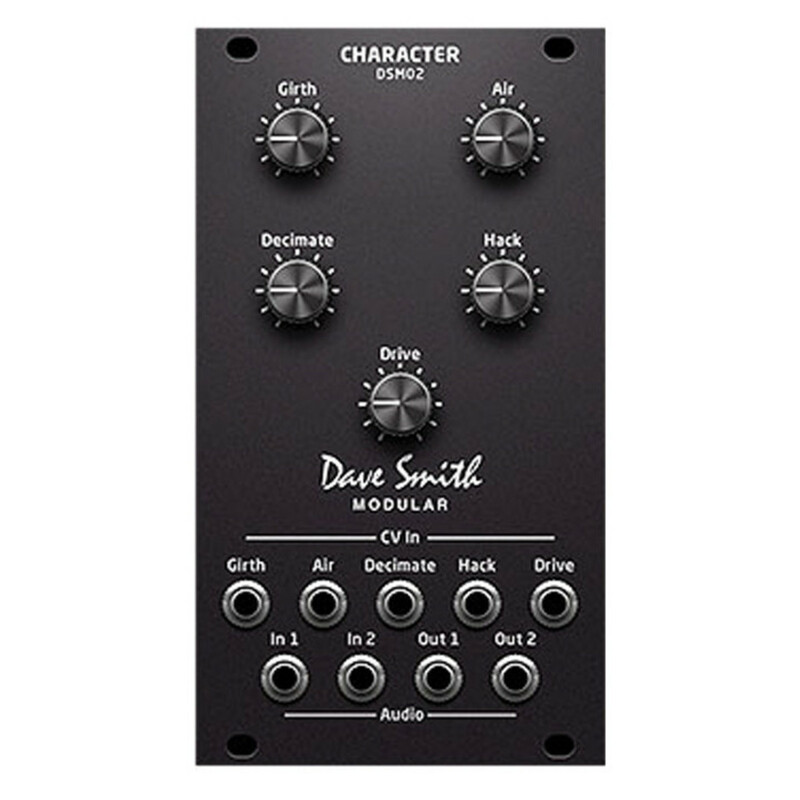 This is designed to make it easy and affordable for modular users to inject some of that character into their rigs. The DSM02 module is a 14HP wide, standard Eurorack format device with interconnections made using 3.5 mm phone jacks. A carefully designed set of inputs allow individual voltage control of effect levels. The module provides two independent audio inputs and two independent audio outputs with shared control, allowing for either mono or stereo operation. The digital signal path provides full 24-bit, 96 kHz resolution for superior audio fidelity.